an appointment to visit our showroom. Renowned as the most complete and thorough line available, Rev-A-Shelf's waste container series includes traditional wire, classic wood, and luxurious chrome frames; original polymer and contemporary stainless steel containers. All with the high-quality and flexibility you need. The option are endless. 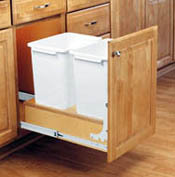 From small pull-out waste containers for small clearance cabinets to the recycling center for the environmentally conscious, we have a pullout waste container for every situation in your home. Of course you know most of our storage organizers are designed for the base cabinet, however this section features those innovative products that are different from any other category like our notorious sink front trays and fashionable rattan wicker baskets. These popular accessories are designed with superior quality and tremendous versatility in mind. Base Cabinet fillers to create space behind those decorative cabinet panels. Organizing the home is easier than ever with Rev-A-Shelf's innovative Tall/Pantry Cabinet Accessories. These ultra-modern organizers are designed to increase functionality and enhance the look and performance of your kitchen and bathroom. Whether your prefer the beautiful look of wood, the luxurious style of chrome, or the more practical white wire and polymer; you are sure to find the perfect answer to your walk-in or in-cabinet pantry needs. Designed to increase the functionality and enhance the look and performance of your kitchen, our ground breaking accessories provide easy access and organization for everyday items. Create a clutter-free home with the inventive selection of Drawer Accessories from Rev-A-Shelf. Organizing is simple with great products like our Cutlery Trays, Utensil Trays, Universal Spice Racks, Bread Drawers, and Entertainment Storage Rails. We've even found a way to expand the space in your drawer with our unique Rolling Tray System for Cutlery and Cosmetics. From the kitchen to the bathroom, Rev-A-Shelf's drawer accessories furnish unlimited storage solutions for every room in your home. Let's face it - the bathroom is usually one of the hardest areas to keep tidy with all those odds and ends...at least, it used to be. Now organizing your bathroom is easy with all the storage solutions in Rev-A-Shelf Bathroom/Vanity Accessories line. Hide your unsightly garbage with a pullout waste container, keep dirty cloths off the floor with a removable pullout hamper, expand your bathroom drawer and more neatly arrange make-up and more with a cosmetic organizer featuring a rolling tray, the choices are unlimited. Specifically designed for 14", 16", and 20" standard depth systems. Made of heavy gauge chrome and featuring full extension slides, these accessories are the perfect addition to your closet system. An extensive line of wood, chrome, and satin organizers for the closet. Pant, tie, and belt racks. Pull-down closet rods. Shoe cubbies... just to name a few.